A Knockout drum with a mist eliminator is common whenever a process requires entrained droplets to be separated from a vapor stream. 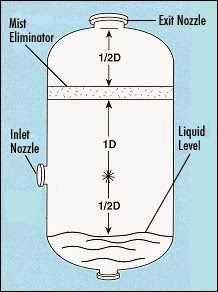 A simple knockout drum (no mist eliminator) will remove droplets larger than about 380 microns by gravity settling M. generally gravity settling removes more than 90% of the liquid entering the vessel .However the remaining droplets smaller than 380 microns can be a significant problem for a downstream unit. A mist eliminator in the top of the knockout drum will remove the remaining droplets down to a diameter of 6 microns or less, depending on the type of mist eliminator. A knockout drum with mist eliminator can achieve an overall efficiency of 99.99% liquid removal. Knockout drums may be oriented vertically or horizontally. In both types, the mist eliminator may also be oriented vertically or horizontally. For a vertical mist eliminator (horizontal vapor flow), the drainage flow is cross-current, whereas for vertical upflow the drainage flow is counter-current. Because cross-current flow results in less liquid holdup, a vertical mist eliminator can be operated at a higher vapor loading without reentrainment (depending on the liquid load and on the height). A horizontal entrainment separation vessel can also be designed to operate as a droplet coalesce. In this case, the mist eliminator operates beyond the reentrainment load. Large, coalesced droplets blow off the down stream side of the mist eliminator and either settle by gravity or are collected by a vane type mist eliminator. A preliminary analysis may suggest that a horizontal knockout vessel may reduce cost. In the final analysis, however, many factors should be evaluated to arrive at the decision between a horizontal versus a vertical vessel. The key design variable for entrainment separation vessels is a vapor load factor, first derived by souders and brown for predicting flooding in distillation columns (2). The derivation is based on the force balance calculation on a droplet falling through a vapor. This vapor load factor is also referred to as a K factor for purposes of determining the flux cross section area of a mist eliminator or knockout drum. Typically, .3 to .35 ft/sec is used as design K factor for entrainment separation vessel. By expressing vapor loading in terms of the Souders-Brown transformation, a design variable is created which is largely independent of the system variable (molecular weight, density, pressure, temperature, viscosity, surface tension etc). this combined variable vapor load factor correlates buoyancy and differential inertial effects for a wide range of liquid/vapor systems. A similar design variable, designated Fs is also used for Liquid/Vapor systems. Fs accounts for vapor inertial effects but not buoyancy effects or differential inertial effects. In hydrocarbon liquid/vapor systems at a pressures higher than approximately 120 Psia, system load factors less than 0.35 ft/sec should be used as the design basis. Droplet terminal velocity departs significantly from Stoke’s Law as the system approaches the critical point. The main reason is that the interfacial tension decreases (approaches zero at the critical point ). Another reason is that the density difference (liquid-vapor) approaches zero. A knockout drum (vertical or horizontal) is typically sized for a system load factor of 0.3 to 0.35 ft/sec. However, because of the need for a mist eliminator support ring, and because of roundup to the next standard vessel diameter, vertical knockout drums typically have a design system load of 0.25 to 0.30 ft/sec. They typically operate between 0.20 and 0.35 ft/sec vapor load factor (3,4). If other constraints, such as space or cost, require a smaller vessel diameter, a design load factor of 0.45 ft/sec may be used; the result is a reduced margin of safety and an increased entrainment load on the mist eliminator. A vapor load factor of 0.2 to 0.35 ft/sec is the optimum range for mist eliminators operating in vertical upflow. Consequently, a full diameter mist eliminator is usually appropriate for a vertical knockout drum. However, if the knockout drum is sized according to a vapor load factor less than 0.2 ft/sec, the mist eliminator should be sized for optimum efficiency. Consequently, a design other than the typical full diameter mist eliminator may be appropriate. For example, if the optimum mist pad diameter is significantly less than the vessel diameter, a sleeve mounting may be appropriate. On the other hand, if the vessel diameter is too small to accommodate the required mist eliminator area as a full diameter unit, the mist eliminator may be oriented in the longitudinal axis. For horizontal vessels, the diameter is based on the design factor of 0.35 ft/sec (as for vertical vessels). However, because of liquid holdup, the cross sectional area for vapor flow causes an operating vapor load factor of 0.4 to 0.5 ft/sec for vertically installed mist eliminators. This vapor load corresponds to the optimum load for wire mesh pads in the horizontal flow. The design basis for the horizontal mist eliminator in a horizontal vessel should be K = 0.5 ft/sec (or less). 1. The top of a horizontal mist eliminator should be at least one-half vessel diameter from the exit nozzle (top or side mounted). This reduces the non-uniform flow through the pad caused by a radial pressure gradient. 2. The bottom of a mist eliminator should be at least one vessel diameter from the centerline of the inlet nozzle (side mounted). One-half vessel diameter is used in some cases (for light liquid loading) to satisfy space constraints. However, if the inlet fluid is a flashing liquid, one vessel diameter is essential for vapor/liquid disengaging. 3. The liquid level should be at least one-half vessel diameter below the side inlet nozzle centerline in order to avoid inducing. 4. If the vessel is to provide a liquid surge volume, the appropriate height increment will be required. For preliminary designs and cost estimates, the vessel aspect ratio (height/diameter) may be estimated at 2.5 (for zero liquid holdup) or 3.0 (to allow for liquid holdup). Knockout drum turn-down and surplus capacity (turn-up), result from the two-phase flow characteristics of the system. 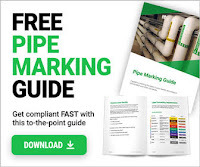 The process conditions for most knockout drum and mist eliminators application occur just below the typical pipe flow regime map. At a system load factor below approximately 0.5 ft/sec, the two- phase flow regime is counter-current for the majority of the liquid. At a system load factor around 1.0 ft/sec , the two phase flow regime becomes annular mist flow (for low to moderate pressure systems). Between 0.5 and 1.0 ft/sec the entrainment load increases from a slight to 100% entrainment. Entrainment load increases considerably beyond a system load factor of 0.5 ft/sec. Therefore many designers would consider this value to be upper practical limit of vapor loading in a knockout drum. Since a knockout drum is designed on the basis of 0.3 to 0.35 ft/sec system load factor, there is around 50% to 100% surplus capacity. Mist pad flooding typically occurs around 0.5 to 0.7 ft/sec. Therefore, the practical maximum capacity of the mist pad/knockout drum combination is again approximately 0.5 ft/sec and the surplus capacity is about 50%. A knockout drum typically has a side entry nozzle the vapor outlet is generally a top exit nozzle. The inlet nozzle should be located one vessel diameter below the mist pad and one-half vessel diameter above the normal liquid height. This configuration allows for the maximum droplet separation by gravity as well as gas jet dispersion and flow distribution. Straightening vanes have been used to partially deflect the inlet jet, but no definitive conclusion have been reached concerning the benefits of straightening vanes in entrainment separation vessels. In older plants, inlet deflector baffles were installed in some knockout drums. The idea was to direct the inlet jet downward and thus to improve the effectiveness of separation. Such a configuration causes a large pressure drop and in many cases interferes with entrainment separation because of breaking coalesced droplets into smaller ones. There is no evidence that an inlet deflector improves performance. If side exit nozzles are used, a special arrangement is required to avoid non-uniform flow in the mist eliminator.The centerline of a side exit nozzle should be one-half pad diameter above the mist pad. Alternatively an upward directed elbow internal nozzle for a side exit can be used to promote uniform flow in the mist pad. Nozzle sizes correspond to the adjoining pipe size. In the preliminary design of the vessel, the nozzle size can be estimated by a “quick estimate” method. The vessel manway may allow vessel entry below or above the mist eliminator. A manway location below the mist eliminator is typical. It should be located at 90 degrees from the inlet jet. A vortex breaker in the bottom of the vessel prevents potential pump suction problems if a pump is used to remove collected liquids. Tangential entry nozzles have been used on knockout vessels, but the swirling action of the gas can interfere with the operation of the mist eliminator. The insertion type unit may be used with a tangential inlet. The term “mist eliminator” is used to denote two basic types: the fiber-bed (or candle) type, and the mist pad (or mesh) type. The fiber-bed is typically a set of cylindrical units which operates at a lower gas flux (lower system load factor) than the mist pad type. The mist pad type may be constructed from knitted wire mesh, woven wire mesh, or corrugated parallel plates. The typical mist pad is an eight inch thick disk (6 inch mesh thickness plus two inches for grids) which mounts in the bore of a vessel such as a distillation column or entrainment separation vessel. Typical mesh thickness varies from 4 inches to 12 inches depending upon the efficiency required. Mist pads are manufactured in an array of unit designs to satisfy a variety of criteria such as maximum efficiency, pressure drop constraints, non fouling, or corrosion. The Vane type mist pad is also called a parallel plate type or a “chevron” type. Vane mist eliminators typically operate at higher vapor load factors than wire mesh types because of less susceptibility to flooding. A design K factor of 0.45 ft/sec is typical for vertical upflow (0.65 ft/sec for horizontal flow). Vane mist eliminators are also less susceptible to fouling than wire mesh types. Higher flow rate of drainage liquid prevents adherence of solid particles to the surface of the plates. The efficiency of vane mist eliminator is less than that of wire mesh because of lower surface area per unit volume (specific surface area). However for many chemical processes the efficiency is adequate to control entrainment. Vane Units may be used in conjunction with wire mesh pad such as for a coalescing knockout drum described earlier, in which the vane unit is installed downstream of the wire mesh pad. The opposite configuration (vane unit upstream of the wire mesh pad) may be used in a fouling service. The vane unit removes the solid particulates (and larger droplets), whereas the wire mesh unit removes the small droplets. In general, vane mist pads should be selected when high liquid rates or high particulate loading are expected. TEX-MESH Technical bulletin 104 discusses design and selection guidelines for vane mist eliminators. The operating envelopes of the entrainment separation vessel and the mist eliminator should be matched to optimize efficiency and cost. Since a mist eliminator functions primarily by inertial impaction, higher vapor velocity corresponds to higher efficiency. Increasing liquid load can induce flooding. Flooding can interfere with entrainment removal even after the upset subsides and flow returns to normal. Eventually, the flood will drain away and the pad will operate properly. 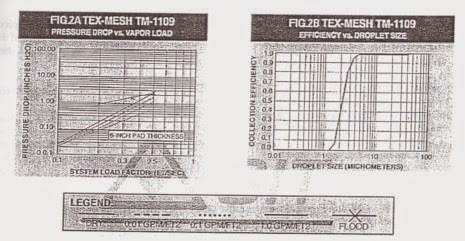 Figure 2A shows the operating envelope of a TEX-MESH TM-1109 mist eliminator in terms of pressure drop versus system load factor. Below the flood point the mist eliminator operates along the curves representing a particular entrainment rate. Once the flood point is reached the pressure drop is not quite unique function of vapor rate and liquid rate. Furthermore, there is a hysteresis effect when vapor or liquid rate is reduced. This hysteresis is believed to be caused by the meta-stable holdup volume in the mist pad matrix. Figure 2B depicts the efficiency versus droplet size for a TEX-MESH TM-1109 mist eliminator at the design load factor of 0.35 ft/sec. At a vapor load greater than the design point, the cut-point diameter decreases. Likewise for decreased vapor load, the cut-point droplet size increases. Below about 0.1 ft/sec system load factor, inertial impaction diminishes considerably. Consequently, the efficiency of droplet capture also decreases. For example, the curve in figure 2B has a D99 cut-point of 5.5 microns (99%efficiency at 5.5 microns for 0.35 ft/sec vapor load factor). For a vapor load factor of 0.5 ft/sec the D99 cut-point shifts to 4.7 micron. For a vapor load factor of 0.1 ft/sec the D99 cut-point shifts to 10.5 microns. Because mist eliminators have a fairly narrow operating range for efficient droplet removal, blanking plates are sometimes used to increase the flux through an existing mist pad. Often segmental blanking plates at the sides of a full diameter square mist eliminator provide operating conditions in the optimum range. For maximum effectiveness blanking plates may be placed opposite one another on both sides of the pad. The sections are fastened by tie-wires, “j” bolts, or hold-down bars. The sections are also tie wired together. The grids on a wire mist pad not only maintain the integrity of the mesh, but also provide support up to maximum span of about six feet. For plastic grids, the span should be reduced to about four feet. Support beams across the vessel are used to support longer spans of mist pad sections. In some cases, grids may be constructed from heavy-duty metal bars to span more than six feet. Dual support rings (above and below) are sometimes used for mounting mist eliminators. In this case, one of the rings has a removable segment for mounting and demounting the pad. Vane mist pads do not need grids because the corrugated plates and tie bolts provide structural rigidity. However, support beams are still required to support spans longer than six feet. Dual support rings, held-down bars, or “J” bolts may be used to secure the sections. If the knockout is appreciably larger than the correct diameter for a mist pad, it is often more cost effective to install the optimum diameter pad than to blank a full diameter pad. One approach is to install a vertical sleeve for mounting the mist eliminator. Another approach is to mount a “can” on top of a wide support ring. TEX-MESH Technical bulletin 103 provides additional details on the installation of mist eliminators. If specified properly, a mist pad generally operates effectively and is essentially an inconspicuous component in a process. However, problems are generally a result of fouling (plugging of the mist pad by solid particles). At start-up, if the process equipment upstream of the mist pad is not flushed adequately, the mist pad is likely to collect dirt, scale, and other debris. Furthermore, after the plant has operated for some time, solids can eventually plug the mist eliminator. Mist pads are efficient collectors of solids as well as liquids. If the solids are likely to reach the mist eliminator, a continuous or intermittent wash system above the pad establishes counter-current wash flow throughout the pad. Spraying from under the pad establishes heavy liquid loading at the bottom and a “dry” condition at the top of the pad. It is critical to limit the total liquid loading (wash liquid plus entrainment) to about 1.0 gpm/ft2. If higher liquid loading is unavoidable, then a corresponding decrease in vapor loading is required to avoid flooding. Vane mist pads seldom fail because of fouling. Solids either pass through or are washed off by the coalesced liquid. Relief Panels have been installed in the mist pads, but they often cause problems. When a mist pad becomes plugged, either the excess pressure drop indicates the problem, or tie wires or other mechanical supports fail, causing an upset in the process. A fouled pad is difficult to clean, but it is sometimes done. Non-Uniform flow in a mist pad can cause a local re-entrainment or local inefficiency. If fouling is not present, non-uniform flow is caused by improper placements of nozzles, baffles or blanking plates. Since wire mesh mist eliminators typically are constructed from stainless steel wire 0.006 to 0.011 inch in diameter, if corrosion failure is a problem, it will become obvious immediately. Correct material selection is essential. A cyclone separator can be used to collect entrainment, but the efficiency decreases with increasing diameter. Consequently, at the scale of process plant equipment, the cost and efficiency often are not competitive compared to a knockout drum with a mist eliminator. Sometimes, a mist eliminator knockout drum is used downstream of cyclone separator to improve the efficiency of entrainment separation. Electrostatic precipitators are often used to remove small droplets as well as particulates. They are much more costly than knockout drum mist eliminators and significantly increase risk of explosion with combustible materials. For these reasons, a mist eliminator is often used upstream of an electrostatic precipitator. The purpose of an entrainment separator is to maximize the detrimental effect of entrained liquid in a vapor stream. Very often, a knockout drum with a mist eliminator is the most cost effective method for entrainment control. Properly designed, the unit will provide trouble-free performance for many years.